If there is a person who can make a hike this hard, super fun and exciting, that person is Rian “Consider-it-done” Bagus. It was the trip of our life, fun and enjoyable, splendid views and experience, and Rian took the term “friendly guide” very ad literam. Friendly, well organised, fun, adventurous and exceptional experience- Ijen crater would not have been the same without him as our guide. Highly recommend!!! My husband and I recently did the Blue Fire Tour. Ijen Expedition did a nice job of coordinating our pick up in Ubud, Bali, ferry to Java, ride up to the volcano entrance, and a guide to get to the top. Our driver, Mr. Yanto, was great. We really enjoyed chatting with him and learning more about Indonesia. I appreciated this group’s flexibility in allowing me to reschedule at the last minute after getting really sick in Ubud. They were very responsive to any and all of my e-mail inquiries. The hike was great and Mr. Yanto took us to a nice hotel on Java to grab some breakfast. He took great care of us. I highly recommend Ijen Expedition for the Blue Fire Tour. Thanks guys! We did 1 night tour from Bali to Mt. Ijen. Our driver Enfan was very friendly. The long drive from Bali to the mountain is very tiresome but I do not regret this experience, maybe next time I will take the tour to this area when I am already in java. Our guide, Dhany, was very friendly and went at our pace up the mountain, even though we were slow like caterpillars haha. The sunrise view and appreciation towards the hardworking miners was definitely worth the trek!! My husband and I booked our tour of Ijen Crater through Ijen Epedition and it was the highlight of our 10 day trip to Indonesia in December 2016. We were picked-up from the hotel in Bali at the agreed time in a comfortable, modern and clean car, to make our way to the ferry point then then proceed to Ijen. Our driver was incredibly polite, was happy to talk to us about tourism, history and politics answering all our question along the way. Our guide was simply fantastic. When the climb up got a little hard, he didn’t rush us – suggesting we take our time, periodically reminding us to stop for a couple of minutes, reassuring that we are still on time and that will not miss the blue flame. As we climbed in to the crater, he watched over us carefully and made sure we were safe, comfortable and helped us navigate some of the more precarious climbs up/down the crater. When the sulfur fumes blew our way, he promptly made sure we turned away from the direction of the wind, our gas masks had extra padding with scarf / cloth to reduce fume inhalation. We got down to the crater, saw the magnificent flame and at dawn saw the breathtaking green lake. It was definitely the highlight of our visit and highly recommend Ijen Expedition to anyone thinking of seeing Ijen blue flame! Very professional. Everything they say is accurate, time, price. Easygoing they adjust to your schedule and very knowledgeable about the place. Also cheaper than most tours, I highly recommend them. The itinerary for the Ijen Bluefire Tour was tailored according to our needs at a reasonable price. We wanted to go directly from the airport, and a pick-up was arranged. The driver of the car (Evan) and Hadi, the tour guide (a local in Ijen), both were very helpful, informative and good travel companions. The drop-off in the following day was also arranged according to our next scheduled programme making it all very convenient for us. All in all it was a very good service from the Ijen Expedition Team. Thank you very much for joining with my team. Me and two friends went on the Ijen blue fire tour from Bali. We only had a few days in Bali so we needed a time-efficient trip. The driver picked us up in Kuta at 7 pm and we arrived at the base of Ijen right in time for the trail to open. We had a very nice guide to accompany us on the climb who told us about the volcanos in the area and provided us with gas masks. The climb was relatively easy and the reward at the top is stunning. Both the blue fire at night and the beautiful scenery that opens up after dawn. We were lucky to hike up under the super moon so even in the middle of the night we could appreciate the surrounding beauty. After descending we were brought back to Bali in the private car and dropped off at our new destination Ubud. This tour was the highlight of our holiday and we are very thankful that i could be arranged from Bali to fit in with our tight schedule. After reading up extensively on how to get to this unreal volcano, I read several backpacker accounts recommending getting there on your own to save money; I’m sooo relieved I decided against that and booked this tour for my two friends and I through Ijen Expedition instead! We did the two days one night package with pick up from Bali and it was great to have everything from transport to accommodation included. I do not think we would have been able to safely manage getting to or going about Java, especially this volcano, without the help of Sam and our guide Lucas. Well, maybe, but it would have definitely been 10x more stressful. We were almost considering not going on this expedition due to previous exhaustion but all three of us agree that seeing the blue fire was an experience that we’re super glad we didn’t miss. It was made even better by the seamless planning of Ijen Expedition and the endlessly friendly help of Lucas and Sam. Driving down from Ijen at 7 am, utterly exhausted, but in the comfortable company of these two jamming out to some Indonesian reggae was a wonderful memory to have in itself. Thanks so much for a great experience!!! As I type this message, I’m sitting in the Juanda airport in Surabaya waiting for my plane home. We had a wonderful experience seeing both Mt. Bromo and Mt. Ijen. The weather was perfect of course, and so we could see everything that was offered and more. Lucas was an excellent guide and extremely professional the entire time working for the expedition company. We had a lot of emphasis on the photography portion of the trip, and so he was very patient the entire experience. Hadi our driver was excellent as well, getting us everywhere in what Google maps would describe as record time. Bravo for making us feel comfortable, while still giving us the freedom to explore this beautiful country. We stayed in Bali for the week previous, and I can say without a doubt that our Java experience exceeded that of Bali because of the tour. Thanks for the adventure. We signed up for a 4 day tour. First night we hiked up Mt Ijen. Finally got to see the blue flames! Getting down to the crater in the dark was no small feat. For that we’re grateful to have our guides Eno and Bondan. They kept us steadily grounded every step of the way. The view of the lake in the morning was spectacular. We reached Red Island beach in time for the sunset. Took many pictures on this awesome beach. The homestay is only a short walk away from the beach. Place is very clean and host hospitable. Green Bay is really a hidden gem. Though a tad rocky, we couldn’t resist the allure of the clear green water. Last but no way least, Sukamade beach. This is where we got to release baby turtles into the sea! There are lots of sand flies on this beach so don’t forget your repellents. Thank you Ijen Expedition for this wonderful experience! Big thank you to Bondan for the pictures and for taking such great care of us throughout the whole trip! My friend and I had a really good time doing the blue fire tour! The flames were amazing. Thank you very much for the tour!! Overall, we had a memorable experience, Sam’s team is pleasant, punctual and most importantly safe! The price quote was very competitive compared to 4 other guiding tours. Thanks Sam (and your team) for the unforgettable experience, many friends around me are already planning to contact you. Huge thankyou to Sam and Sony and the entire Ijen Expedition team. Sam was easy to deal with when arranging the trip from home, and even helped me out with a last minute change to my plans. Meeting his family and colleagues at his lovely home stay was a great experience, before a quick nap to get ready for the climb. Sony was a fantastic guide (who doubled as an exceptional photographer for the night) and made sure our night was the best it could be. This was one of the best tour experiences I’ve had anywhere in the world. sukses selalu brother dan salam kenal. The price is reasonable. The pre-arrival arrangement is good as well with quick response. As we arrived earlier than planned, we were brought to a cafe, chilling while waiting. Tour guide, Sony and driver, Akid are very kind and friendly. Sony is knowledgable about the Ijen and stuff. At last, Sam almost forgot about the payment until we reminded him. 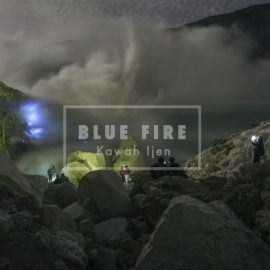 It was fantastic experience at Ijen to see blue fire…. This company staff were very nice and prepare good Hotel to stay. Especially, a guide whose name is Oron was awesome!! He knows well about Ijen volcano and he has pretty good skill to take photos. I forgot to say, you should advertise to Japan, actually I’m Japanese. I bet many Japanese will love this tour. I try to find Japanese web site to see Ijen blue fire , there is a few Japanese tour agent. Please let Japanese people know this fantastic mountain. Hi Sam , I am planning to do a 5D4N tour to Ijen this Dec. I heard such good stuff about you. would be great if you can organise and personally show us. We will be at Surabaya on 5 Dec. I am Eric . How can I reach you ? Terima kasih untuk bantuannya selama disana. Sabar banget nemenin kita yang jalannya lelet… Juga untuk pinjaman sleeping bags-nya. I spent 2 full days visit Bromo and Ijen. The trip was awesome and I’d like to highlight to Ijen even though the weather not that good in the day I am hiking but it became my exciting experience. The way hike to Ijen very easy but slippery in dry season. I would live to visit again and I expected Sam to come along with me. Thanks Sam to prepare my trip!! Look forward to seeing you so soon!!!! When we arrived in the mountains, I met up with Sam who gave a brief description about the tour. After a short nap in the beautiful hut , we started our adventure at 1 a.m. We drove up the mountain to a parking lot and then walked up the rest of the mountain which is not a big deal for averaged trained persons. When we entered the crater Alan led the way down which was pretty steep on some parts (make sure to wear proper foot-wear). The experience in the crater was overwhelming: huge smoke fumes, big yellow sulphur rocks and of course the astonishing blue fires. We also walked to the dead lake inside the crater. After we walked around and enjoyed this incredible site we climbed back on the top of the volcano and enjoyed the sunrise. On our way down to the valley, we stopped at a coffee and banana plantation, where Alan explained me the way of growing the different fruits in Java. Doing the Kawah Ijen Expedition with Sam and his guides is definitely a must-do when you are travelling through Java or Bali! It was the best experience throughout my whole south-east Asia journey. You won`t find such great hospitality and nature elsewhere! PS: Make sure to bring a (rainproof) jacket with you as it might get pretty cold on top of the volcano. Good shoes will help you managing the steep parts. Anything else (masks, torch,…) was provided by Alan and Sam. I would like to thank Sam for being a very dependable, punctual, warm and amazing guide. He managed our three day trip to Mt Bromo and Mt Ijen in a very efficient manner. I would like to recommend Sam to anyone heading to this region. Sam has excellent knowledge of area. Sam was ever ready to go out of his way to help us in getting the best out of our trip. Sam is also an excellent photographer. He patiently waited for us when we took extra photography breaks and also took us to best secret spots where we could have the clear view of the volcanoes. What more can I say about Sam? Entertained every last one of my group’s unreasonable request including a last minute request to be our guide. Sam is a true local who knows his way around and is ever cheerful. More importantly, he cares tremendously for his guest as seen by him providing an additional car for our extreme guide of ijen and Bromo in 1 day at no additional cost. Rinjani next year for me and there’ll only be one guide I’d trust with that expedition. @sam, remember to send over the pictures brother! Thanks for being so hospitable. thanks brother @russel i hope you happy with my service see you next year for rinjani…. bro! I have heard a lot from many of my friends who traveled in Indonesia that the MOST beautiful scenery is ‘Bromo’ mountain. So, my husband and I planned to go there along with Ijen for 5 days. However, as an expat living in Indonesia, I don’t know well about the local tour package while I also know the most of tour packages for foreigners are too expensive. Then, Sam’s tour package, which is at reasonable price and has benefits for being able to travel with local guide (Sam) who is a professional photographer!! Sam is the best guide for Bromo and Ijen tour because he was born and grew up there and he is a professional photographer! Of course, he is super duper sweet and funny!! thanks mbk grace…. we love you to….. Anyone looking for a guide to the Ijen Crater, SAM is highly recommended. He can also be your photographer for your Ijen trip!!! Best of all, you will always have a good laugh and a good explore of the place. Many thanks Sam; we haven’t started working on our photos… way too busy down here. We will send you the link when it’s done. Visit Bangkok sometime 😉 Please send our regards to Sis and to the one and only good female driver in Banyuwangi (Efie). You want to have a Ijen tour? Then you must have Sam to be your tour guide!! I was a solo traveler, and I really glad to have Sam as my guide. In addition to climb amazing Kawah Ijen, Sam took me to some beautiful places in the village, and also meet some friends and his families, I really enjoy it. Without him,I don’t think I can have a such wonderful tour and lots of nice pictures(he is also a good photographer!)!. Anyway, Sam is my best choice for exploring Ijen. Terima kasih Sam! We slept for few hours in a 5* tent (pitched by Sam and mate) before waking up all excited at 1am to climb Ijen and catch the blue fire. As there were 5 of us, 2 guides came along with us. One to lead the way and another to make sure that no one gets left behind. I was slow and was very glad to have Sam patiently accompanying me up the steep slope and taking care of me. While Sam went down the crater w 2 of my pals, his mate asked if we wanted coffee and started setting up a fire to boil water. We felt blessed to be so well taken care of. Must hv been heavy for them to lug up the water n heating gadgets. We descended earlier and after we reached base camp. His mate was v nice to set fire again to cook instant noodles for us hungry folks. Blessed! All in our team will agree that Sam is an impressive self taught photographer! Pity that I did not get to pick up a few more tips from him! We had a memorable trip at the beautiful ijen thanks to the duo and I’ll definitely recommend his trip to others! Take care n all the best!